How to use NVI? It’s easy! 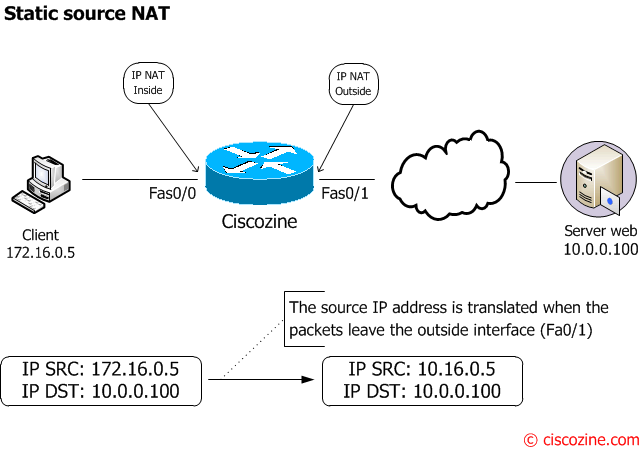 You must use the command ‘ip nat source …’ without specifying the inside/outside tag and enable the nat to the interfaces using the command ‘ip nat enable’. To better understand this feature, I will explain NVI using the same examples presented in the previous article ‘NAT and PAT: a complete explanation‘ (take no notice of the ip NAT inside/ouside in the images). Then define the translation depending on the NAT/PAT used. Like legacy nat, you need define three things. The Web server (172.16.0.5) is listening on tcp port 80; this server responds on public address 88.88.88.88:80 from the Internet. The SSH server (172.16.0.6) is listening on tcp port 22; this server responds on public address 88.88.88.88:666 from the Internet. With static NAT, translation exists in the NAT translation table as soon as you configure static NAT command, and it remains in the translation table until you delete the static NAT command. With static PAT, translation exists in the NAT translation table as soon as you configure static PAT command, and it remains in the translation table until you delete the static PAT command. 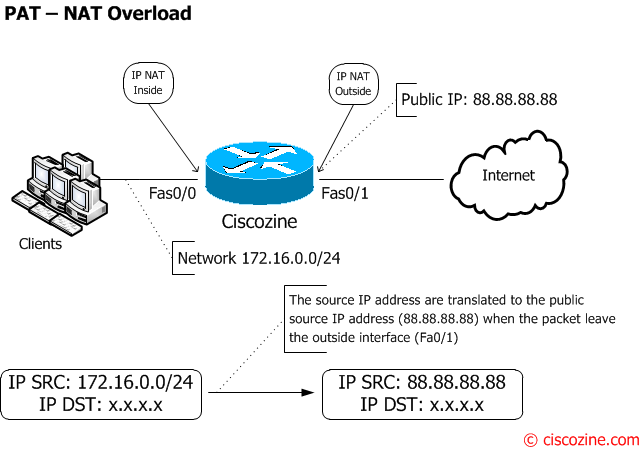 With NAT overload, translations do not exist in the NAT table until the router receives traffic that requires translation. When you enable NAT (legacy or not), the IOS enables a virtual interface called ‘NVI0’. This interface is used ONLY when the ‘ip nat enable’ is enabled. This interface can be found with the command ‘show ip interface brief’ or ‘show interfaces’. Cisco recommends to use legacy NAT for VRF to global NAT (ip nat inside/out) and between interfaces in the same VRF. NVI is used for NAT between different VRFs. 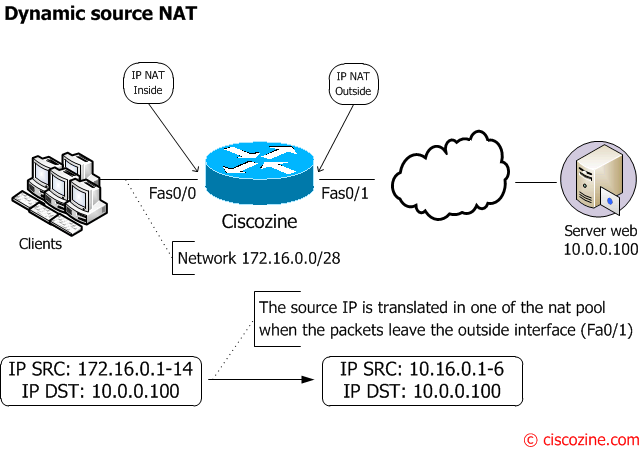 Stateful Network Address Translation (SNAT) is not supported. Cisco has introduced a new feature called NAT Virtual Interface; NVI removes the requirements to configure an interface as either NAT inside or NAT outside. An interface can be configured to use NAT or not use NAT.